I have written a lot about the rock ovens used on the Great Northern, but I was forwarded a photo of a rock oven on the Milwaukee Road at Beverly, circa 1950. Anyone have any history on it? While researching for the latest Centennial story I am working on (for 1979-1989) I came across this map. Differences from today is there is no line between Adrian and Wheeler, the branch to Mansfield is gone, and the line from Mesa to Sagehill is gone. There are many other changes as well. Can you pick them out? The 1970s marked the continued decline of the railroad industry, as the chokehold of the Interstate Commerce Commission never let up. Railroad companies tried many ways to stay financially afloat, including merging with rivals or parallel lines. This was done to reduce overhead expenses and redundant tracks. Another tactic was to continue reduction of passenger trains which had previously been mandated to continue by the Interstate Commerce Commission (ICC); this major effort culminated with the formation of Amtrak to remove passenger train losses from the railroads. Railroads in the northeast United States were in worse shape. In an ill-fated merger, the New York Central and the Pennsylvania Railroad were allowed to merge in 1968 as the Penn Central. They were forced by the ICC to take on the bankrupt New Haven railroad as well. The resulting mega-railroad was not successful, as these railroads were in poor shape. Penn Central declared bankruptcy on June 21, 1970. It was the largest corporate bankruptcy in American history up until that time. Some railroads did not fare well during this decade. The Chicago Rock Island & Pacific (The Rock) was trying to merge with the Union Pacific (UP) starting back in 1964, but the ICC took its time in studying the idea. During this time, the Rock was floundering and was unable to keep up on maintenance. The UP backed out of the deal and the Rock went into bankruptcy. In January 1980, it was determined the Rock could not be successfully reorganized and it was ordered by the bankruptcy court to be liquidated and sold; the resulting action made the Rock the largest bankruptcy liquidation in U.S. history at the time. All eyes were on the newly-formed Burlington Northern (BN), which was allowed to merge on March 2, 1970; the Great Northern (GN), Northern Pacific (NP), and Chicago Burlington & Quincy were thought to be strong railroads, but they too were in a slow decline. When the government instituted regulations on smog and acid rain, the low-sulfur coals being mined alongside tracks in Wyoming and Montana became of great financial importance to the BN. The Milwaukee Road benefited from the BN merger since the ICC forced the BN to grant use of its track to key cities such as Portland, Oregon. Changes in the way it was allowed to interchange freight with the BN allowed it to become a formidable competitor to the BN, which had some marketing challenges in its early days. The Milwaukee gained traffic and was able to make more money than it ever had on its line to the Pacific coast. Previously, the Milwaukee had sought a merger with the Chicago & Northwestern, as both lines had many miles of marginal track in the Midwest, with the hope of making one strong system out of the two. This stemmed from the resignation of the Milwaukee president in 1957, and his replacement by an inexperienced successor, so the board of directors thought the best course was to get rid of the railroad somehow. The ICC had asked for terms that the Northwestern was not able to accept, and so this merger did not happen. Right after the BN merger, the owners of the Northwestern offered to sell their railroad company to the Milwaukee Road, instead of merging. Their offer was rejected, even though the Milwaukee had sought nearly this very same thing over the last decade. Management had decided that a merger with a larger road was their only salvation. Right away, they petitioned for the Milwaukee to be included in the merger with the UP and the Rock. In 1973, the Milwaukee then sought reopening of the BN merger proceedings, to be included into the railroad that now surrounded it. This was rejected because the ICC felt it had already granted numerous concessions to the Milwaukee in the BN merger to strengthen it. The BN was clear that they had no interest in this petition. In February 1973, and against the advice of studies conducted by both the railroad and independent groups, the Milwaukee decided to scrap its electrification scheme. The board of directors considered the electrification scheme an impediment to its merger and consolidation plans, and believed that the money required to maintain it would be better spent elsewhere. The high copper prices of the time, and the resulting $10 million the railroad estimated it would get for selling off the copper overhead wire, contributed to the decision. 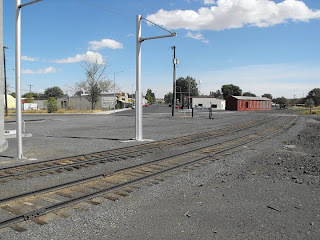 The surveys found that an investment of $39 million would close the electrification gap between Avery, Idaho, and Othello, and provide the finances to buy new locomotives and upgrade the electrical equipment all along the line. Furthermore, the displaced diesel locomotives could be used elsewhere, reducing the requirement to purchase new, dropping the true cost of the plan to only $18 million. General Electric even proposed underwriting the financing because of the railroad's poor financial position. Rejecting this, the railroad dismantled its electrification just as the 1973 oil crisis took hold. By 1974, when the electrification was shut down, the electric locomotives operated at half the cost of the diesels that replaced them. Worse, the railroad spent $39 million – as much as the GE-sponsored revitalization plan – to buy more diesel locomotives to replace the electrics, and only received $5 million for the copper scrap because prices had fallen over the course of the year. Power agreements written when the railroad was young had been very favorable to the Milwaukee, amounting to nearly the free use of electricity to operate its trains. With the discontinuation of electrification, there were no agreements, and the railroad was seen as a regular industrial user of power. The Milwaukee discovered that it now had large electrical bills for the operation of stations, signals and equipment. Despite slow decisions by the ICC, railroads continued to try to reduce underperforming branch lines. At the time, branches were seen as very important to the survival of any town of significance; now they were seen as a liability to the railroad, because of the lack of traffic and the upkeep of the tracks. In our area of the country, some railroad expansion was still happening. The laying of track on what would be called the NP’s Wahluke Branch to the Mattawa area began in July of 1969. The first 31 miles of the line were to be finished by year’s end, but soon stopped. The branch was about 55 miles in length, as measured from Mesa, but rails never reached any further than mile 21. Bridges of heavy design were built to the end of the prepared grade. The railroad left the line unfinished because business conditions changed and felt that there wasn’t enough agricultural development in the region to justify completion; it had been anticipated that water from the Bureau of Reclamation would increase productivity of the area. Railroading changed in Grant County in a big way on March 2, 1970 with the formation of the BN from the GN and the NP. This merger meant that most of the railroad track in the county was now controlled by one railroad. 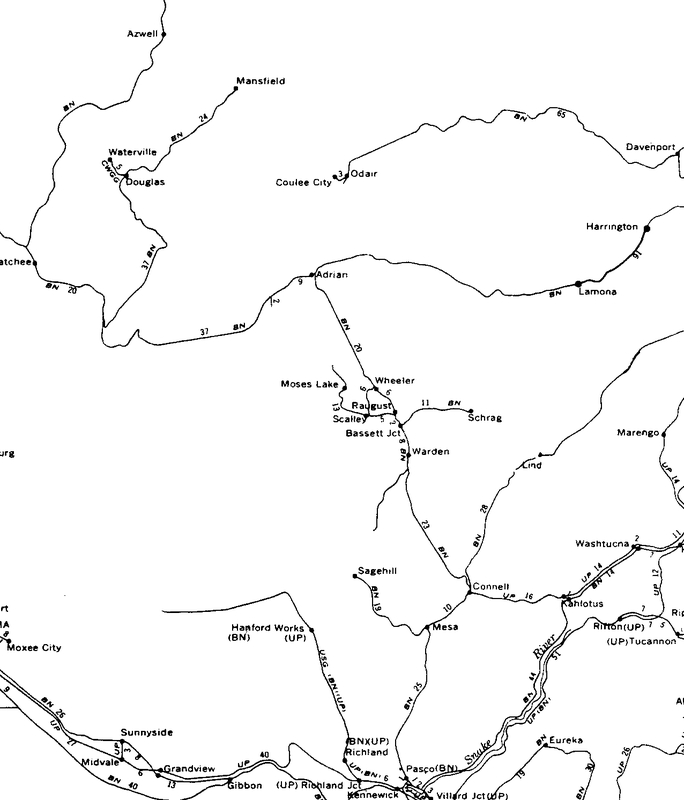 Not much changed operationally, as there was the old GN mainline, plus the NP branch lines. The formation of Amtrak on May 1, 1971 brought even greater change. While branch line passenger trains in the county were long gone, the GN/BN was operating the Empire Builder and the Western Star, pretty much as it had been running it separately since the 1950s. When Amtrak took over passenger service from the mainline railroads, it used fairly erratic criteria for deciding which lines to service; some routes were chosen based on the need in the area for service, others for their population centers, and others by the influence of congressional members vying for the nostalgic service to continue in their own jurisdictions. Under this plan, it discontinued the two remaining NP mainline trains, and the GN Western Star. 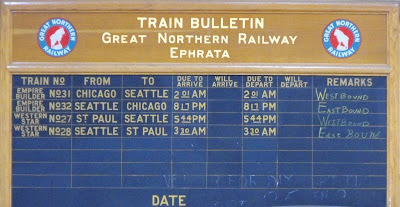 The Empire Builder was to continue to run, but would no longer operate via the old GN line through Grant County, instead being rerouted using the old NP mainline through neighboring Adams county as part of its new route between Spokane and Seattle. This move was seen as a way to tap the larger passenger markets of the Tri-Cities and Yakima versus Wenatchee and the comparatively smaller Grant County towns. This prediction wasn’t entirely true. In Coulee City, The News-Standard reported that a late January 1972 trip of cub scouts from Coulee City to Hartline and back was well received. Trips such as this had been arranged from time to time for the scouts, and there never seemed to be any lack of enthusiasm from either the children or their adult chaperones, no matter which line of locomotives they rode. Not long after this, the BN depot in Coulee City was burgled and a small amount of cash stolen in the few hours the railroad agent was away. Two years later, a car loaded with John Deere drills headed for Jim Jess Implement was found to have defective brakes after it rolled under its own power through Coulee City, stopping 30 feet off the west end of the tracks. While incidents such as these were not too uncommon in railroad history, it was another example of the many frustrations that small-town stations endured during the decline of the railroads. Another Amtrak casualty was the end of railway post office service on the old GN line. The service had been running from Williston, North Dakota, to Seattle since 1934. Now the mail would either go by truck or by a new train offered by the BN, but no sorting en route would be done. Railway post office service had offered speedy delivery of mail at first-class rates that even express or priority service cannot achieve today. In 1972, the Milwaukee Road ended electric locomotive service on its Coast Division mainline between Othello and Tacoma. This decision was anticipated, since diesel locomotives had been found to be easier to use on this section of line and faster than the old electric locomotives. The overhead wires were maintained in working order for a time to keep copper thieves at bay. None of these positive appraisals resulted in BN’s acceptance of the Milwaukee’s proposal, though. Already it was apparent that there were too many repairs to be made on the Milwaukee’s track, and the BN wasn’t interested in the large number of Milwaukee branchlines across the Midwest. On the other hand, changes in railroad needs caused the removal of the 1898 Wilson Creek depot in 1975. Another piece of railroading disappeared when long-time railroad agent C.W. ‘Skip’ Connor, BN agent for Coulee City, retired June 1, 1977 after 40 years with the railroad. The railroad decided to not replace Connor in Coulee City and the depot closed at the end of the work day. The Milwaukee Road filed for bankruptcy for the third time on December 19, 1977. An ICC audit later discovered that, for some reason, the railroad had been double-entering expenses for its line to the Pacific coast during most of the 1970s. Far from the unprofitable boat-anchor the railroad and the bankruptcy trustees said it was, the ICC found that the line had been returning a profit to the railroad even through 1978, at which time traffic was severely down because of the road's decision to not maintain the track and because of claims of damaged shipments due to derailments. That year also saw the abandonment of the former NP branch from Odair to Adrian, known as the Adrian Cutoff. There had been no shipments on this stretch of track since completion of the Dry Coulee Siphon by the Bureau of Reclamation. The NP had not operated over the line much before that, save for cement shipments for construction of Grand Coulee Dam, handed off by the GN for shipment to the dam in the late 1930s to early 1940s. The BN hardly used the line at all, save for some car storage. 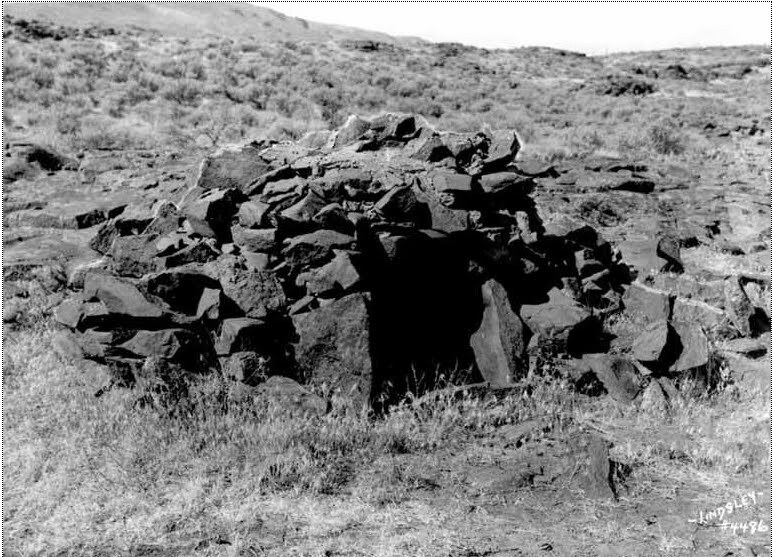 The BN held permission from the ICC to complete the old NP Wahluke branch as late as July 1978. Beyond the mid 1970s, the line was not used beyond Basin City due to a slide in the vicinity of milepost 11 or 12, though the rail was good beyond it. In 1979, the Coulee City Women’s Club became aware of plans to dismantle the Coulee City train depot and asked the BN for permission to use it as a senior or community center. It was donated to the Women’s Club, who in turn gave it to the Coulee City Senior citizens, provided it be moved to another site. Former resident Tom Price donated land so the depot would be permanently positioned. A total of $2500 was donated by the Coulee City Women’s Club for the move and renovation. The seventh decade of Grant County’s history was bleak, but a light had begun to grow at the end of the tunnel. Plans were emerging to deregulate the railroad industry and even the Basin saw a bright future. The weather and my schedule finally coincided to provide a sunny day last week to take the modern photo. The only thing that has not changed is Main Street in the background. The depot in the 1909 photo had its upper story removed in 1966 during a remodel. It is now located just out of view in the 2009 photo, still being used as the Senior Center. In the place of the depot now stands a couple of very large grain silos. The plans for building the silos included details of how the soils contained debris from the depot. It would have been fun to check the site out with a metal detector before they started building! The tracks in the 1909 photo were realigned to fit the unit train grain loader, just out of site to the left of the 2009 photo. The large silver colored pole with the wire connected to the next pole is for connection of a harness system, so elevator employees have some protection from falling off grain hoppers when loading. The "Coulee City" sign in the 2009 dates to the Burlington Northern era, and was placed after the depot was removed. The depot, in its new position, still retains its Northern Pacific era while lettering on black "Coulee City." There are lots of other changes, like trees and buildings, and lack of people in the current photo. The rails now have tie plates, but the rail itself is still pretty light. From the "Annual Project History Columbia Basin Project"
Construction Railroad. A railroad connection to the Grand Coulee dam site was one of the first items of work to receive attention. Both the Northern Pacific and Great Northern Railway Companies located lines into the dam site as previously described in Chapter I, under "Surveys". The Northern Pacific filed for a permit to construct their line, but interjected conditional stipulations, requesting exclusive franchise rights. A hearing on the application was held by the Department of Public Works in Olympia, Washington, January 22, 1934, at which time the Government entered a petition of intervention, requesting issuance of the permit but without the exclusive franchise provisions. The Department considered the conditional stipulations of the railroad company to be invalid and ordered that they be excluded from the permit. As a consequence, the railroad company abandoned the project, and the Government thereupon decided to build its own construction railroad. Funds were made available in March, the line was surveyed in May, and right-of-way was acquired soon thereafter. The line began at Odair, a siding on the Northern Pacific Railway, about two miles from Coulee City, and ran through the Grand Coulee, terminating at its north end in a transfer yard about two miles from the dam site. This section of line, 28.33 miles long, was located with maximum three-degree curves and one per cent grades, suitable for the operation of standard railway locomotives. The remaining two miles to the dam site was designed for the operation of gear-type locomotives, the maximum curvature being fourteen degrees and grades up to five per cent. Specifications No. 572 were issued covering the complete construction of the first 28.33 miles of single-track railroad, including a delivery yard at Odair and a siding at the head of Grand Coulee. The schedule of work also included laying and ballasting track in the two-mile end section. Standard railroad designs were adopted with track to be built of 90-pound second-hand, or relay rail which was loaned to the Government by the Northern Pacific Railway Company, to be returned within ten years after completion of the present contract. The contract was awarded to David H. Ryan on July 17, 1934, and a notice to proceed was issued August 8, 1934. Construction work progressed rapidly, and by the close of the year grading was completed, track was laid, and 90 per cent of it ballasted. Track laying in the two-mile end section was delayed, pending the completion of grading, which was being done under a separate contract. Sliding ground, in this section, made necessary certain revisions in location which retarded progress on the grading contract. Governor Clarence D. Martin and Senator C.C. Dill were honored guests upon the occasion of "Driving the Golden Spike", which took place December 8, 1934. Highway and Railroad. The final two-mile section of highway and railroad from the head of Grand Coulee to the dam site involved heavy construction because there was little choice as to its location. The line traversed precipitous canyon walls, dropping about 350 feet in elevation to the Government camp site. Grading involved extensive rock excavation and side-hill work in ground some of which later proved to be very unstable. The project included a railroad spur to the warehouse and power house, which necessitated construction of three switchbacks and a highway under-crossing. Specifications No. 569 were prepared covering the grading and structures for a highway and railroad, the former to extend from the head of Grand Coulee to the proposed Columbia River Bridge, and the latter from the same beginning point to the proposed west-side power house. Included in the specifications was the grading of streets, parking areas and sidewalks in the Government camp site. The road and railroad were located on the same grade and parallel to each other for a portion of the distance above the dam, the highway then dropping, on a maximum ten per cent grade, to the camp site and the railroad continuing along the hillside, adjoining Government camp, on a maximum five per cent down grade. The combined highway-railroad roadbed was designed for a minimum width of 48 feet, sufficient for a standard gauge railroad and a 28-foot surfaced highway. The usual drainage and guard-rail structures were included, as well as one combination timber and steel overhead railroad crossing. Track laying and road surfacing were provided for in separate specifications. Bids for the work were received April 5, 1934, when Crick and Kuney of Spokane, Washington, submitted the low bid of $220,676.50. Because of slides which had developed (referred to under "Excavation"), it became necessary to relocate a portion of the line--and notice to proceed was deferred until June 30, 1934. Immediately thereafter, the contractor commenced operating with the following equipment in use: 3 shovels, 2-yard; 1 shovel, 1 3/4 yard; 8 trucks, 8-yard; 7 trucks, 6-yard; 2 Caterpillar tractors with bulldozers; 5 portable compressors; 1 tractor and Le Tourneau scraper. No special construction difficulties were encountered after grading work started, with the result that the contractor made very satisfactory progress. In October, the road was open throughout its entire length; and at the end of the year, the contract was 96 per cent complete. Mansfield Branch to Grand Coulee? And Other Dam Facts. Construction Railroad: Preliminary surveys for a railroad to the Grand Coulee site were made in 1933 by both the Northern Pacific and Great Northern Railway Companies, the first running from Odair, a siding located about two miles from Coulee City, and the latter extending a branch line from Mansfield, Washington. 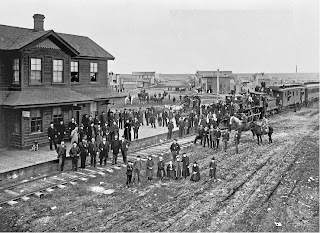 The Great Northern route proved impractical because of the heavy grading work required, but the Northern Pacific line was quite satisfactory; consequently, that company applied for a permit to build. The permit was granted by the Interstate Commerce Commission of February 13, 1934; however, when the company's request for exclusive franchise rights was denied by the State Department of Public Works, it abandoned the project. Thereafter the Government decided to built its own railroad, and immediately engaged the Northern Pacific Railway Company to locate a line from Odair to the head of the Grand Coulee, this being substantially the same route which that company had formerly located. The location survey was completed in May, and thereafter all engineering work was transferred to the Bureau of Reclamation. Two engineering residencies were established, No. 1 covering the first seventeen miles and No. 2 the last eleven miles. A contract for construction of the railroad was awarded to David H. Ryan, who started work on August 9, 1934, and thereafter the resident engineers with their field surveying crews were in constant service on the railroad project. Considerable surveying was involved on Residency No. 2 in mapping lands at the railroad terminus which were to be used for storage yards and a proposed steel rolling mill site. Highway and Railroad: Adequate transportation facilities were provided by the State Highway and Government Construction Railroad, both of these terminating at the head of the Grand Coulee; however, there remained about two miles of railroad and highway to be built by the Bureau of Reclamation to complete transportation facilities to the dam site. This project was undertaken as a combination railroad and highway project in December 1933 and continued throughout 1934. The alignment traversed the west side of the Columbia River gorge, being definitely limited, as to its location, by a controlling "1310" elevation at the axis of the dam, and thereafter by a five per cent railroad and ten per cent highway grade limitation, to the Government Camp warehouse area. Because of these restricted conditions and the steep, rocky slope upon which the grade had to be constructed, considerable engineering detail was involved, including the location of two railroad switchbacks and an overhead crossing of the highway. A heavy rock cut was required near the axis of the dam, and further complications arose when an earth slide of considerable proportions, in March 1934, caused from dam excavation, necessitated relocation of a portion of the line. The engineering work was assigned to tow resident engineers, one handling the railroad project and another the highway. Contractors Crick and Kuney received notice to proceed on grading work on June 30, 2934, and thereafter the usual routine engineering surveys in connection with construction operations were performed by two partings working under the direction of the resident engineers. Grading was substantially completed at the end of the year.